Many Koreans around Boston are asking for the Korean restaurants in the Boston area to improve by creating and focusing on specialized menus that are more authentic. Koreans that have been to Korean towns in New York City or Los Angeles said, “The food and service were as good as they are in Korea,” and expressed their wishes to visit again. Moreover, people are expecting more restaurants to specialize in authentic stews and noodles such as 'Seolleong-Tang' and 'Naeng-Myun'. Saebyuk Han, a Korean American who recently visited New York City, showed pictures of food that he took on his phone and said, “I wish there were restaurants like that in Boston.” He introduced a restaurant called ‘Tang’, which specializes in ‘Seolleong-Tang’ and ‘Galbi-Tang’ and highly recommended it. She wished that either specialized restaurants from Korea like ‘SinsunSeolleong-Tang’ or ‘Myeong Dong Kalguksu’open up a branch in Boston, or the Korean restaurants that are already here specialize and focus on creating unique menus. Is the economic recession causing the number of Korean customers to decrease? The owners of Korean restaurants are beginning to wonder if the only reason for the decrease in the number of Korean customers is the economic recession. As Lee said, the number of Korean customers in the Allston area where many Korean restaurants are located has been decreasing. There are less Koreans showing up in this area, and also many students have returned to Korea for the summer. An office worker named Lee, after visiting a Korean restaurant in Allston a few days ago, said he was surprised to see so few customers in restaurants even during lunchtime. ‘Kaju Tofu House’, which opened in Boston early last year and has been successful ever since, offered a change to Koreans’ food choices. The reason for its success was the soft tofu stews served in earthen pots, raw eggs, rice tea made instantaneously with scorched rice, and most importantly the menu that specialized in soft tofu stews. 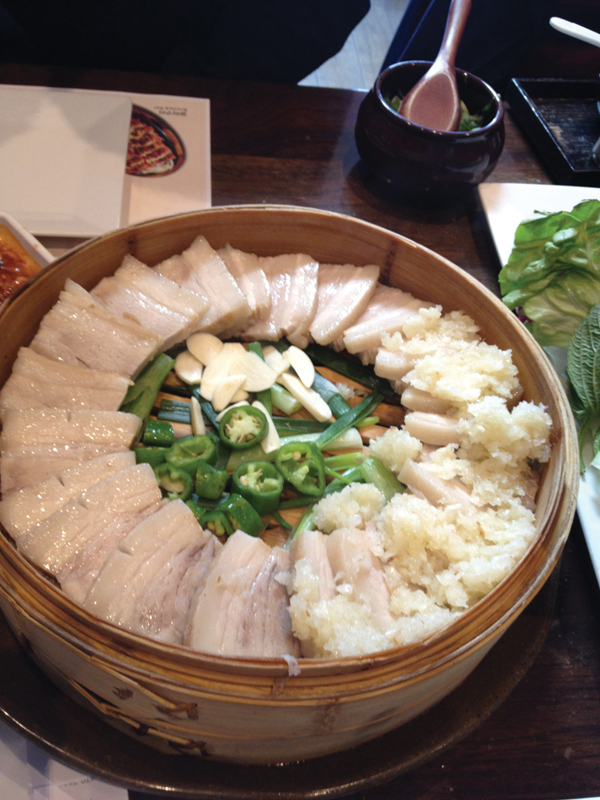 Moreover, the restaurant gained many Koreans’ attention by suggesting its specialties through its name itself. Similarly, ‘Buk-Kyung’, a ‘jajangmyun’ restaurant that opened in Somerville and Allston around 10 years ago, became prosperous by satisfying the demands from Korean customers. Michelle Lee, the owner of ‘Kaju Tofu House’ who spent an entire year paying the rent and went through inspections and hearings before finally opening, said, “Boston is one of the toughest places to open up new restaurants.” She believed that it was two times as hard as it was on the west coast. However, she emphasized that, “it means the market has a lot of potential.” The competition between Korean restaurants in Boston is nothing compared to the ones in cities on the west coast such as Los Angeles. For instance, the Soju price competition has been noticeably intense in areas like Los Angeles or New York City. Although the average price for a bottle of Soju is around $8-10, competition between restaurants can drop the price down to $4.99 and $3.99 in extreme cases. This is an enormous difference compared to the rather consistent price in Boston that averages around $11.99-14.99. Marriage and social organizing businesses like “Zzack USA” and “Gori” enter Boston. The opportunities for Asian actors are limited in America He wishes to become a guide for.. Written by HyunCheon Kim / Translated by JaeMin WooMany Koreans around Boston are as.. Written by HyunCheon Kim / Translated by JaeMin Woo‘Superstar K’, which has produced.. The recruitments for Tae Kwon Do and Golf are prioritized. The lack of financial support s..